A recent study by ExactTarget and Ball State University showed that consumers 24 years old and younger prefer text messages to email. For consumers 25+, email still reigns supreme. Does that put text/mobile/SMS out of reach for most brands? Not at all. In fact, using mobile to drive email subscriptions is an emerging best practice. Mobile opt-in is instant, exceptionally easy for the subscriber, and the brand gets both an email address AND a mobile number for use when text messaging is more prevalent in the U.S. 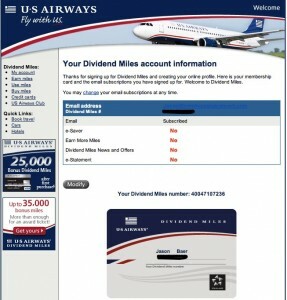 I should have joined US Airways’ points program long ago. I fly the airline often, but haven’t signed up for the program because I didn’t want to take the time to fill out a long, online form, etc. Other than the fact that US Airways was practically daring me to violate the in-flight ban on cell phone usage, I was enthralled. One text message with your name and email address, and you’re enrolled. Very slick. Almost immediately after signing up via text, I received a nifty email confirmation that included a digital membership card, and two offers for bonus mile via credit card offer. While the creative on the offers wasn’t spectacular, the use of transactional email to drive additional action is on the mark. But then the next day, I received another email that mentioned something called TEXTUS (evidently the system that runs the mobile opt-in program), and asks for me to provide additional info to activate my account. I understand the need/desire for more info from me, but shouldn’t they have asked for that before I got my nifty digital membership card? I wasn’t offended, but I was confused. And that could have been easily avoided. And why was that sent a whole day later? Then, once I did in fact log-in to provide additional information, I received another confirmation with another digital membership card, and related offers (more this time). Again not bad, but a bit puzzling. Overall, a great program. Fills a need. Makes it easy. Confirmation and follow up is a little wacky, but extra effort for being an airline (not typically the most nimble marketers) and pulling off a mobile program. 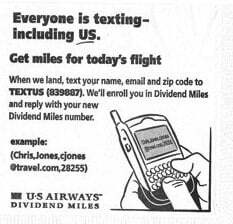 I anticipate mobile opt-in will be big in 2009. The prevalence of SMS capable phones make it a natural for point of sale e-mail subscriptions for newsletters, special offers, and other programs. Could you use mobile opt-in effectively? What’s your plan?